David Massey is away today so I'm going to fill the gap with some wise words from the brain behind the Bet Less Win More tipping service. That brain is Gary ‘The Boz' Boswell and the Bet Less Win More service is all about slow and steady profits. Some might say it's not very exciting when you win a small amount everyday and the gamblers reading will no doubt prefer the excitement of losing runs followed by big winners. But if you want to make long term profits a little bit most days without ever dropping into the red has a lot going for it. 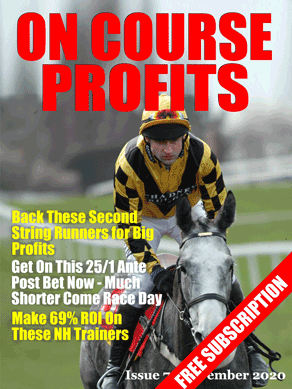 The excerpts below are taken from an article Gary wrote for the Betting Insiders Club. A breakthrough realisation for me in the early days and still the one that best helps me to keep ahead in the long term. It's not how everyone plays I know. For some, starting with a 100 point bank, they are not in the least bit phased by going 60 or 70 points into the bank. Confident they have the strategies to build back the losses. And certainly that belief in your methods is crucial but I learned early as a tipster that the big priced winners were neither a daily nor even a weekly occurrence for me. Not to be relied on anyways. In my 2016 annual tipping cycle, I had just six successful backs at 10/1 or over. That's with tipping every day, seven days a week. Likewise, my longest winning streak was just 8 days achieved last week of August. All seven of these successes were however notable for not having to cover any losses of substance. They were pretty much all pure winnings and there were no balancing losses of any great note simply because of the way I play day to day, doing my damnedest to stay at break even, or just either side thereof. So that when I do land the big one, I push my annual plus figure well forward. It's a psychology I can recommend if you have patience as a virtue in your personality. No rollercoaster ups and downs. Just long periods of equilibrium punctuated by occasional profit peaks and a healthy plus at the end of the year. And the bank in place pretty much throughout. The furthest I went into my starting 100 in 2016 was 8.67 points and the furthest this year so far is 7.38. And that was with a 21 day losing streak in January 2016. The way to achieve this state of never really losing but occasionally winning is by being stingy with your money and your bets. By foregoing those eff it bets, the ones where you're not really sure but you want a bet, or where you think it's just a fiver maybe I'll get lucky. The reason that didn't eat 21 points into my bank is because of the cautious way I play. Often hedging but more importantly keeping a keen and disciplined eye on my staking. Very often decreasing stakes after a loss and after a win too. Indeed, whenever my instinct is to up stakes, I question it per se. Am I really that confident of my tip? If after rigorous inquiry I am confident, I'll go up but that is not a frequent occurrence! Much of the long term success of betting lies in getting your staking right, or at worst, minimising your mistakes. And, of course, I still make those. The mindset required to bet this way is to think more about not losing than about winning! As soon as I started playing with the absolute determination of never doing my 100 point bank again, I started the turn into being a winner. Both as a tipster and as a gambler myself. And they are two very different things but united by that premise that playing to break even most of the time – and having patience to wait for the mega win to roll in (and of course continuing to try to achieve that without serious risk of denting bank) works and is fundamental. All content quoted is copyright 2017 Gary Boswell.